George is a business developer by day. At night, George likes to dabble with game development. With the release of XNA, this hobby has become less frustration and changing the colors of triangles and more "Wow! Did you make that Dad?" With XNA Game Studio Express, developers can create games using the XNA Framework. While developers have always been able to make games, the XNA Framework has reduced the once steep learning curve for game development and made it into something more attainable for the masses of developers who dream of making their own game. All at no cost to the developer. In addition to XNA providing free and less complicated game development, games developed using XNA Game Studio Express will be playable on Microsoft’s Xbox 360. An opportunity like this is unprecedented in game development history. Hobbyists have never before had the chance to play their games on a console without friends in high places or loads of cash to purchase the expensive console development software and licenses. 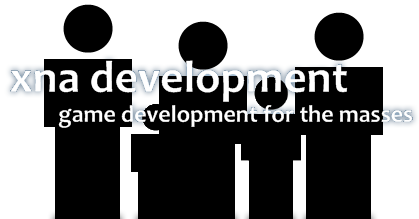 With more developers being able to create games and an increase in interest for the chance to be able to show “their” game on the Xbox 360, XNA Development.com was created to provide this new community with easy to follow tutorials and code samples for game development. With a strong focus on 2D game development, XNA Development.com strives to make it possible for everyone to understand how they can realize their own dream of making a game. Please do not think of these tutorials as the “right” or “best” way of making a game. They are simply a stepping stone in the path to creating your own game. Whether that game is for you, your children, your friend or the start of your own game company, XNA Development.com wants to be there to help you through those rough spots. By providing well documented code and using good development practices whenever possible, XNA Development hopes to be a quality site in providing that resource you need to get your game going from start to finish. XNA Development.com is in no way affiliated with Microsoft. Any and all feedback and suggestions are welcome. XNADevelopment.com is in no way affiliated with Microsoft.